I wrote this review while participating in a campaign for Mom Central Consulting on behalf of Chicco and I received a promotional item to thank me for my participation. When it comes to buying baby gear I found that one of the most difficult things to choose is a car seat. With my first, I spent hours researching car seats on blogs and consumer review sites to be sure I was making the right choice. There are so many different car seats available for infants and toddlers all with different features. Now, you could have the safest car seat on the planet but if it’s not installed properly or your child isn’t strapped in correct than it’s not going to protect them the way it should in an accident. Be sure that your installing your car seat correctly and if your not sure visit your local fire department and they can check it for you. 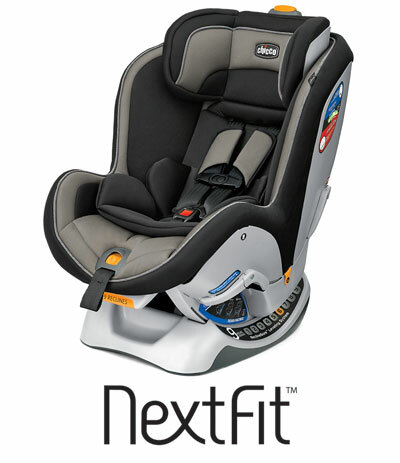 Chicco now has a new car seat that will help you install your car seat properly called the Chicco NextFit. Chicco, the Italian company that created the award-winning, top-rated KeyFit infant seat is launching its first convertible seat designed for the North American market. Just like Chicco’s #1-rated KeyFit® infant car seat, the NextFit™ is designed to help parents easily install their convertible car seat correctly – every time. Fits your vehicle. Fits your child. The NextFit truly is the easiest convertible car seat to install accurately and securely in a wide range of vehicles because of its innovative safety and convenience features. The NextFit grows with your baby, easily adjusting to fit baby as he or she grows from infant to preschooler (from 5 to 65 lbs). Accurately: Just like the KeyFit, the Chicco NextFit takes the guesswork out of installing the seat thanks to the two RideRight™ bubble levels which clearly indicate the correct seat angle in both rear and forward-facing modes. Securely: Parents of any size or strength can easily install the NextFit correctly with the SuperCinch™ LATCH tightener, which uses force-multiplying technology to help achieve a tight and secure fit – no strong muscles required. As a parent who’s been there and done that installing car seats I know how the features of the Chicco NextFit take the uncertainty of installing a car seat by making it easier and eliminating the guesswork of – “Is it angled correctly?”, “Did I pull the belt tight enough on the base?”, “Is my child positioned correctly?”. We all want to do best by our children and these wonderful little features help parents properly install their car seat for the ultimate protection in an accident. Buy It: The Chicco NextFit car seat is available at Babies R Us, Buy Buy Baby and other retailers for $299.99. To find a retailer near you visit the Chicco website. Rear-facing is safest. The American Academy of Pediatrics and the National Highway Traffic Safety Administration recommend rear-facing as long as possible. Parents should keep child rear-facing until at least 2 years old, longer if the car safety seat weight and height limit allows. Young children are fragile and are best protected in a rear-facing car seat. To ensure a child can stay rear-facing as long as possible, purchase a convertible seat when your baby outgrows the infant seat. Most children younger than 5-years old are not mature enough to sit without a full harness. Keep your child in a forward-facing car seat with a harness until at least 5 or 6 years old. Most common mistakes can be avoided by simply following manufacturers’ instructions. All car seats must meet stringent Federal Motor Vehicle Safety Standards to be sold in the U.S. It is when they are not used correctly that makes them unsafe. Always read and follow the instructions for the safety seat. Also, read the vehicle owner’s manual section on child restraints. Always buckle your baby into the safety seat first, and then cover the baby with blankets. Avoid bulky clothing and add-on products such as car seat buntings. This can interfere with proper harness fit and crash performance of the seat. A good trick for older children is to buckle them in without their jacket and then put it back on them backwards over the harness. Not only do these techniques ensure proper harness fit, but also avoids overheating by allowing the baby to be easily uncovered or the child to take his jacket off once the car gets warmer. Always use the top tether when installing a forward-facing car seat. The tether reduces movement of a car seat in a crash and helps to achieve a tight installation. I love these features, I always worry that my son’s car seat isn’t at the right angle and the bubble indicator would be a huge help. Very nice! My daughter is due next month and I’m going to show her this carseat because she’s been having trouble deciding. I love the safety features on this one. We have a Chicco stroller and I love it. This looks like a great car seat too. this is great, I’m car seat shopping now and I’m very impressed with the features on this car seat. We’re looking into carseats for our baby on the way and Chico has some great seats! Thanks for sharing your review! 40 years ago when I had my kids there was nothing like this. Looks great. This looks like a great car seat! I really love that it’s so secure. That is so important. We are going to have our first baby and I have been reading a lot about car seats. It says even if you buy convertibles, it is always better to be on the safe side and buy an infant car seat as well. But the Chicco seems to have covered most of my queries. Looking forward to read more about this one! Thanks for the review. Yeah, it really has some great features. We have an infant seat as well for our little one too.